I hope you got spoilt to death today by a loved one, I woke up to yummy chocs and a HUGE card, no flowers though so standards are deffo slipping LOL. But today is all about shouting a few of my Passionettes that are celebrating their Special days. Is Sharni's Birthday today and she likes yellow, I hope she still likes it this is the third year she has been a demo along with her mum. 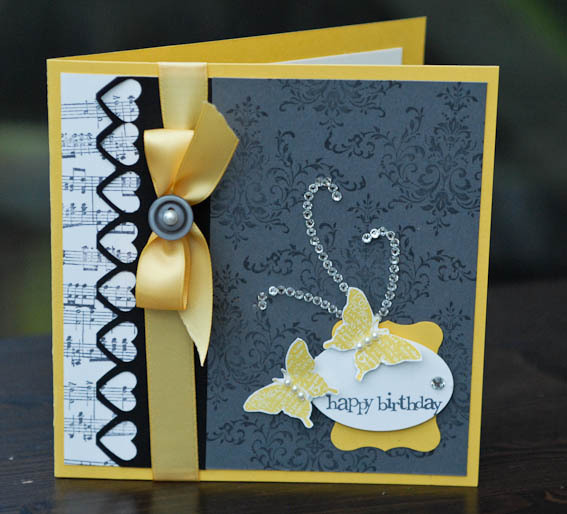 I have used the Music Notes wheel, the Bliss set and paired Daffodil delight with Basic gray and basic black. I also used a mixture of pearls and rhinestones. The sweet punched border I made after seeing Vicky's brilliant card here. Satin ribbon in Daffodil delight and ink in the same colour ensure that my card has a coordinated look. Sharni I hope you had a fabulous day and you got lots and lots of yummy presents. Hugs from me I hope you like your card. Melon mambo Pumpkin Pie and Old Olive and the level 1 hostess stamp Because I care. I have used a mixture of inks to add colour to the bloom and I am so sorry that you cannot see the fabby shimmer on the flower head. I have used my aquapainter to add a wash of champagne shimmer paint then topped with pearls, what did we ever do before the pearls and rhinestones, I seem to use them on EVERYTHING!!! 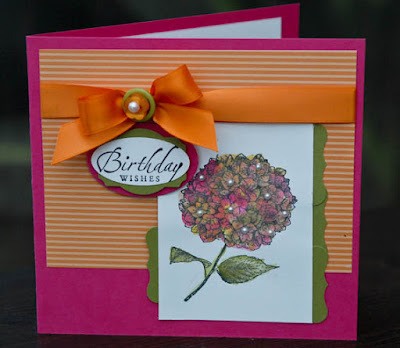 I love the layered punched shapes for the sentiment this is a cased idea from one of my talented downline Karen. I LOVE our punches because they are so quick to add extra interest to your projects. Note the designer label punch used as a border as well. Hope your day was FABULOUS Annette mwah. Is another twisted easel card in Rich Razzleberry ( I know this is another of Jane's fave colours) and pretty in pink. Now let me tell you something if you have these papers do me a favour and put them on top of a piece of razzleberry card. They go together so nicely the pink is not pretty in pink more of a mauve pink and it looks fab with razzle I love it and will be using it again for sure. The stamp is the Level 2 hostess set Fast and Fabulous, Happy Birthday sentiment from the Curly Cute set and Sweet friend sentiment from the Hello You stamp set. Pretty in Pink satin ribbon and a scrunched up bloom made from same papers and using the Boho Blossom punch. I also quite like the cute paper ruffle at the side of the main panel, made with the scallop trim border punch. Jane Happy Belated Birthday honey, date is changed in my diary for future reference and hope you liked your card. Three fabulous cards Monica, I can not have a fave as they are all gorge! Stunning cards. Curious about the easal card tho. How U do that? All totally awesome cards, Monica!!! Bet the lucky ladies LOVED them so much! Spoiled to death? You have to be joking!!!!!!! Flowers... no. Chocolates... no. Card... no. Your cards are beautiful by the way. Looking forward to seeing you in Leeds! Hi Monica - you are one talented crafter. I love all your stunning cards - particularly love that razzleberry card, and the ruffled paper border looks fab - must remember that idea LOL! I'm sure all your friends adored their cards. Hi Monica! Thank you so much for the mention, and can I just say how much I've enjoyed browsing through your beautiful cards!